0.1xDNmm3/S. 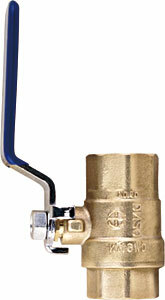 Therefore, acceptable valves with metal seals possibly have slight leakage. So, in the applications where must not be any leakage, especially at the pipeline ends, ball valves with soft seals should be used. ◎If the ball valve with pipe thread connection is connected with the pipe threads on the pipe end, its female thread may be parallel or tapered one, but its male thread must be tapered type. When installing the valve, it is necessary to clamp the hexagonal or octagonal position on the same side as its thread instead of the hexagonal position on the other end of the valve, so as to prevent the valve deforming. ◎Nominal pressure of brass ball valve is 1.6MPa, 2.5MPa, 4.0MPa, the temperature is -20℃~150℃. When the valve is used for saturated steam. The pressure of the saturated steam should be ≤0.6MPa. 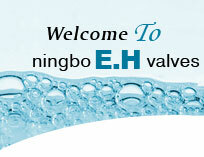 surface and thus affect the sealing performance of the valve. ◎The maximum permissible leakage of the stop valve with non-metal elastic seals is zero, and that of the stop valve with metal seals is 0.1xDNmm3/S. 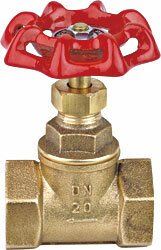 Therefore, acceptable stop valve with metal seals possibly have slight leakage. So, in the applications where there must not be any leakage, especially at the pipeline ends, stop valves with soft seals should be used instead of that with metal seals. ◎If the stop valve with pipe thread connection is connected with the pipe threads on the pipe end, its female thread may be parallel or tapered one, but its male thread must be taper thread when installing the valve, it is necessary to clamp the hexagonal or octagonal position on the same side as its thread instead of the hexagonal or octagonal position on the other end of the stop valve so as to as to prevent the valve deforming. 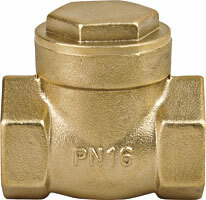 ◎Nominal pressure of brass stop valve is 1.6MPa. Medium temperature for metal seal is -20℃~150℃, and medium temperature for non-metal seal is -10℃~110℃. 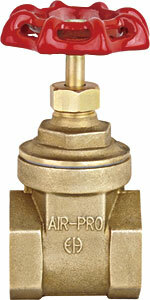 When the stop valve is used for saturated steam, the pressure of the saturated steam should be ≤0.6MPa. ◎If the gate valve with pipe thread connection is connected with the pipe threads on the pipe end, it is necessary to control the external length of the pipe end in order to avoid excessive screwing in, which will pressurize internal end face of the pipe threads of the gate valve and result in deforming of the valve seat and damage its sealing performance. ◎Nominal pressure of brass gate valve is 1.6MPa ，2.0MPa，medium temperature for metal seal is -20℃~150℃. When the gate valve is used for saturated steam, the pressure of the saturated steam should be ≤0.6MPa. ◎To increase the service life of a gate valve, it should be fully opened or closed instead of partial opening for throttling purpose, as when it is partially open, the flowing medium will erode the ball and sealing surface and thus affect the sealing performance. ◎Hard seal is unsuitable to be mounted at the terminal. ◎The maximum permissible leakage of the check valve with non-metal elastic seals is zero, and that of the check valve with meal seals is 0.1xDNmm3/S. Therefore, QC passed valves with metal seals possibly have slight leakage. Hence, in the applications where check valves must not have any leakage, non-return valves with soft seals should be used. ◎If the check valve with pipe thread connection is connected with the pipe threads on the pipe end, female thread may be parallel or tapered one, but male thread must be tapered pipe thread. When installing the valve, it is necessary to clamp the hexagonal position on the same side as this thread instead of the hexagonal position on the other end of the valve, so as to prevent the valve deforming. ◎Nominal pressure of brass check valve is 1.6MPa and medium temperature for metal seal is -20℃~150℃, and medium temperature for non-metal seal is -10℃~110℃. When the non-turn valve is used for saturated steam, the pressure of the saturated steam should be ≤0.6MPa.